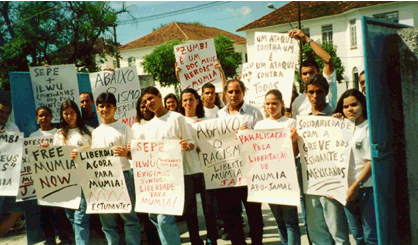 The Labor Action Committee to Free Mumia Abu-Jamal (LAC) was founded in 1998. We have defended Mumia for twenty years since Mumia was represented by his second appellate team (Eliot Grossman, Marlene Kamish and Nick Brown), and a number of our founding members have defended Mumia from the very beginnings of his case. We base ourselves on the principle that Mumia was framed by a racist, capitalist legal system, and that militant class struggle action, through the labor unions and the mass mobilization of the working class, is necessary to win Mumia’s freedom. Examples of such class struggle action include the Oakland Education Association’s (OEA’s) city-wide teach-in for Mumia in 1999, which two LAC members initiated and coordinated against the opposition of the OEA leadership and the local NAACP. We also helped to organize the West Coast port shutdown for Mumia on April 24, 1999. 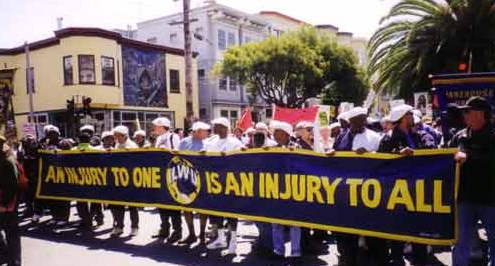 The resolution for that action, which included a march of 25,000 through the streets of San Francisco, was introduced by LAC member and then-ILWU (International Longshore and Warehouse Union) Local 10 Executive Board member, Jack Heyman. We commend the students from Harvard University for their initiative and courage in calling to disinvite Krasner. However, given the critical importance of this present moment to Mumia’s freedom, we have some additional remarks to add to theirs. The argument that Mumia deserves freedom only because of procedural violations (whether committed by Judge Sabo, Justice Castille, or others) has existed in the Mumia movement for a long time. It has sometimes allowed organizations to softpedal criticism of the police, as well as prosecutors like Krasner. It has also resulted in excluding or sidelining Mumia from so-called “progressive” events and spaces. The authors of that memo specifically wrote that the “alliances” and “key constituencies” they had in mind were “police, prosecutors and law enforcement experts”. Why is Mumia, then, a “lightning rod”? It is not just because he is accused of shooting a cop. Rather, it is because he is a self-proclaimed revolutionary. Mumia first came around the Black Panther Party in Philadelphia in 1967, at the age of 13, and joined two years later. He says that he was “beaten into the Black Panther Party” by the police, because of their repression of black youth at events such as the student-led mobilization to rename Benjamin Franklin High School in Philadelphia for Malcolm X. Mumia also attended, in 1968, a demonstration in South Philadelphia to protest George Wallace, at which all the protesters were severely beaten by the Philadelphia police. Later, after the Panthers, he joined the MOVE organization. Mumia’s politics are not confined to the struggle for black liberation, though that is obviously important to him. A casual examination of his commentaries on fascism, the internal divisions in the British Labour Party, monopoly capital, or his seminal history of the Black Panther Party, “We Want Freedom,” reveals a powerful, explicitly class-centered critique of international capitalism. Mumia is a thinker in the tradition of W.E.B. Du Bois or C.L.R. James – one who also has the power to move the masses. The power of Mumia’s voice, as a representative of a strata of the working class segregated at the bottom rungs of American society, is undeniable. And it is precisely because of that voice that those layers of society whose interests are represented by the police – and the prosecutors – will never permit his freedom. The only road to Mumia’s freedom – and, in point of fact, the only reason he is even alive today – is mass organization. In this particular moment in American history, there is a pronounced political polarization, with growth on both the Left and the Right. This has been expressed, on “our” side, in movements such as Occupy, Black Lives Matter and the emergence of “socialist” electoral candidates. This is a positive development, and it has resulted in progressives such as Krasner being propelled into positions of power with a mandate to “reform” the criminal justice system. We criticize politics, not personalities. It is important to assess what role Krasner plays structurally. In the 1970s, in the heyday of the New Left, there were also “progressive” prosecutors and even “progressive” police chiefs. Such efforts, as we are already beginning to see, always eventually run afoul of the fundamental contradiction that a “progressive” prosecutor or police chief presides over that arm of the state apparatus which is tasked with social and political repression. We look forward to working alongside you and all groups and individuals who are struggling for Mumia’s freedom.